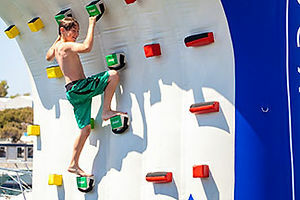 3m x 5m ‘Standard’ Climbing Wall – EUR 8,235.25 nett. 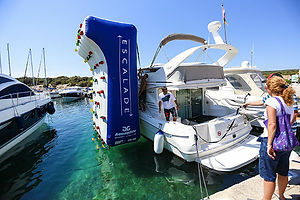 The Marine Toys and Tenders team are highly experienced in yacht climbing wall development and can offer valuable advice specific to your yachts architecture and requirements. Please contact us if you’d like a helping hand. The fun starts here, but the challenge will never end! 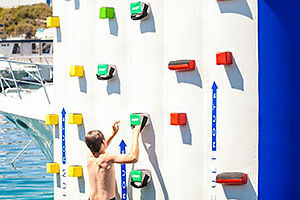 Pushing the boundaries of versatility in a never before seen combination of fun, challenge and exercise – our inflatable climbing wall is more than just a luxury water toy. 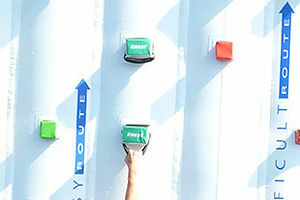 Offering a daily workout that builds core strength and fitness, you can test your physical limits with progressively more difficult routes from easy, medium and hard, while enjoying the competitive challenge when racing friends to the top and the exhilarating plunge down when things don’t go quite to plan. 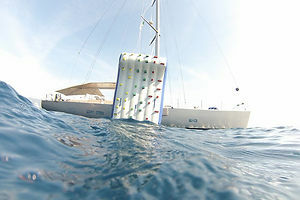 Marine Toys and Tenders offer a standard 5m x 3m yacht climbing wall in stock ready to ship worldwide from our European and Asia Pacific offices. Alternatively we offer solutions for your custom built climbing wall, designed with your requirements in mind and including over-hangs, traversable sections, additional ropes to climb up and to any width or height specifications you wish. 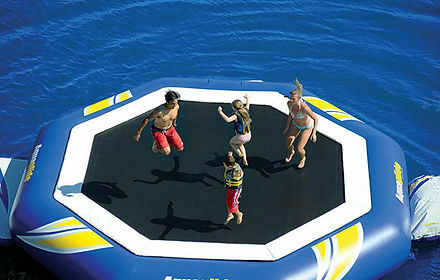 With our standard size setting up time in just 20 minutes, the fun begins almost instantly! 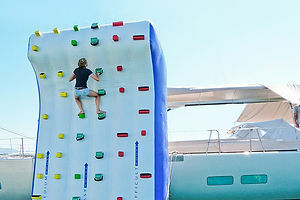 Order your Climbing Wall today… will you be the first to the top?! Names or logos can be printed on the side of your customised climbing wall to give it that personal touch. 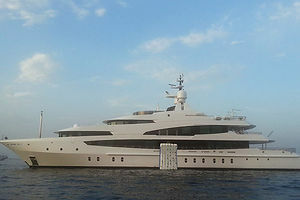 Please remember to send us your yachts name or logo as an Adobe Illustrator .ai file or .eps art file for all artwork. We’ll send you our technical design drawings for your approval and ready for manufacture. Confirm your order and make your first 50% instalment upon receipt of our invoice. Put your feet up while we build your dream toy – production begins once we receive your payment. One week before completion of your toys, we’ll send you a photo update and ask for confirmation of your shipping address to get an accurate shipping quote. 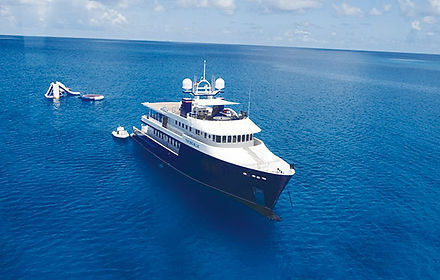 Prior to shipping we’ll send you an invoice for your second 50% instalment including shipping. Before you know it, your toys will be en route and you’ll receive tracking details from us. Your toys arrive on time, wherever you’ve told us to deliver them. 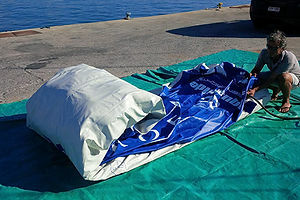 Just inflate and play! We can give you an accurate quote using just that first measurement. We know how important the specifics can be, so your quote will include storage size, weight and estimated set-up time.